holiday plants, there may be others that can add some variety. My all time favorite is anaryllis. But, holiday cactus, cyclamen, kalanchoe, red or white begonias and impatiens, or even a topiary roseary tree can provide holiday color. I have even seen white blooming hydrangea that would look lovely included in a planter with vivid red verbena or petunias by the front door. A bright red geranium outside is also lovely. When choosing plants with blooms, look for those with only a few blooms open and plenty of buds, healthy foliage and a compact form. 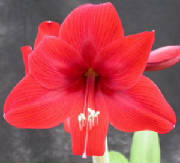 For amaryllis, look for plants with a bloom stalk part way up and the bud well formed. If you purchase an amaryllis in one of the pre-packaged boxes, be sure to open the box to see if the bulb has already sprouted a bloom stalk that is twisted inside the box. These bloom stalks will not straighten, so only choose those with bulbs that are just beginning to sprout. punch holes in it. Then, when you water the plant, let the water drain well before placing the plant on a water proof saucer to protect your table top. Keep blooming plants in cooler temperatures to preserve the blooms longer. Cyclamen prefer very cool temperatures, so if you place them in a protected area outside over night when no frost is predicted, the blooms will last longer. Be sure to bring them inside in the morning before any sun can reach the blooms. The other plants listed should be placed in areas with high levels of bright light but no direct sun. Also keep them out of drafts; either cold from a door or in front of air-conditioning or heating vents. added to your landscape. I call amaryllis the Florida tulip. The bulbs will thrive and multiply in well drained soil in a site with morning sun and some dappled afternoon shade. I plant several in large pots so that I can protectg them from hungry deer. They bloom around March or April every year. The bulb that is forced to bloom at Christmas will not bloom the first spring it is planted but shoudl reward you with blooms for years after. Begonias and impatiens do very well in our winter landscapes. 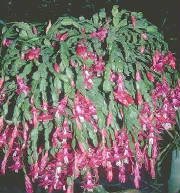 Impatiens need forst protection and can become deer candy, so a container might be the best idea for these plants too. Kalanchoe is perennial in our area and enjoys full sun and a well drained soil. Rosemary is also perennial and planted in the landscape can become a small shrubby bush and will provide fresh rosemary for culinary uses year round. Hydrangeas prefer soil with an acid pH along with morning sun and mid-day through evening shade. They are more of a challenge to grow here, so you might treat them as an annual instead.